There are moments when Ethiopia seems to belong to an atlas of the imagination – part legend, part fairy-tale, part Old Testament book, part pulling your leg. In this land of wonders there are medieval castles of a black Camelot, monasteries among Middle Earth peaks accessible only by rope and chains, the ruined palace of the Queen of Sheba and the original Ten Commandments in a sealed box guarded by mute monks with killer instincts. Its isolation is legendary. Not only was Ethiopia never colonised, but it also inflicted the greatest defeat on a European army in the history of the continent – at the Battle of Adwa in 1896. It was only the Italians, of course, but it still counts. Ethiopians were “forgetful of the world”, Edward Gibbon wrote, “by whom they were forgotten”. For long medieval centuries Europeans believed that Ethiopia was home to Prester John, legendary Christian ruler, descendant of one of the three Magi, keeper of the Fountain of Youth, protector of the Holy Grail, and all-round good guy who would one day rescue the Holy Land from the Muslims. Crossing the threshold of the church of Medhane Alem in Lalibela , I seemed to step back a thousand years. Cut by shafts of dusty light from high windows, the interior gloom was scented with frankincense. I came round a pillar to find a dozen priests leaning on their croziers, chanting in Ge’ez , a language no one has spoken since the Middle Ages. The sound was a curious cross between Gregorian plainsong and a nasal Arabic call to prayer. These were among the earliest Christian rites, unchanged for well over 1,500 years. Worshippers sat on the ground against the bare stone walls, wearing clothes that wouldn’t have been out of place in the Book of Genesis. They gazed mournfully at a pair of threadbare theatrical curtains. Beyond the curtains lay the inner sanctum, the Holy of Holies , which held the Ark of the Covenant . For a country with so much to offer, it is surprising to find tourism in Ethiopia still in its infancy. The war and famine of the 1970s and 80s, though now almost ancient history, may be partly responsible. But a deeper issue may be a feature of the national character – a lack of entrepreneurial urgency. Ethiopia may not be big on stylish boutiques hotels, littered with objets d’art and architectural magazines, but it is a delightfully old-fashioned place, with ravishing landscapes, sleepy villages and friendly, unhurried people. It is difficult to pick a single destination from Ethiopia’s treasure chest, but first-time visitors shouldn’t miss Lalibela and its remarkable churches, all below ground level, and all carved from the rock as entire buildings with surrounding courtyards, exterior walls and roofs. Historians are uncertain about much of their history but Ethiopians have a handle on it. A celestial team of angels came in at night to help out after the terrestrial workforce had clocked off. There are always two histories in Ethiopia: the history of historians, sometimes a trifle vague, often tentative; and the history of Ethiopians, a people’s history, confident, detailed, splendid, often fantastical. The two rarely coincide. Historians are still wringing their hands about the mysteries of Aksum in Tigray in the north, with its colossal stelae, its underground tombs, its ruined palaces and its possible connections to the Queen of Sheba. For a thousand years, until about AD 700, it was a dominant power in the region, “the last of the great civilisations of antiquity”, according to Neville Chittick , the archaeologist, “to be revealed to modern knowledge”. Fortunately, the Ethiopians are on hand to fill in most of the historical blanks. The city was founded, they say, by the great-grandson of Noah. For 400 years it was ruled by a serpent who enjoyed a diet of milk and virgins. Historians may be divided about the Queen of Sheba but Ethiopians know she set off from here to Jerusalem with 797 camels and lot of rather racy lingerie to seduce King Solomon. Historians carelessly lost track of the Ten Commandments not long after Moses came down from Mount Sinai. Ethiopians have the originals under lock and key in a chapel in Aksum, guarded by those mute monks, assigned to kill all intruders. The landscapes of Tigray are appropriately Biblical. It is a world where everything comes and goes by foot or hoof, a world of timeless villages perched beneath vast mesas and plunging ravines, a world where it is possible to imagine startling young men turning water into wine. With my bag loaded onto a Palm Sunday donkey, I set off on a three-day walk down the Erar Valley . I strolled through the latticed shade of eucalyptus trees, past scented banks of sage and mint, past stands of prickly pear and neatly ploughed fields framed by irrigation channels. I rested under the shade of vast fig trees beneath colonies of hornbills, bee-eaters and firefinches. A man in a white robe was winnowing wheat, tossing yellow forkfuls into the air, allowing the wind to take the chaff. Children ghosted out of orchards with home-made toys: a ball of goatskin and twine, a doll of twigs and wool. In the late morning I passed people coming back from the weekly market, two hours’ walk away. They were carrying some of life’s essentials: bags of rice, new sickles, bolts of bright cloth, blocks of salt that had come up from the Danakil Desert by camel caravan. Everyone stopped to greet me with handshakes and smiles. The trek was part of a new community project. The guides and the transport – my faithful donkey – were provided by local villagers who, with the help of NGOs, have also built hedamos, or guesthouses. There is something special about these Tigrayan guesthouses – their location. Tigray is a mountainous region, characterised by ambas: dramatic, sheer-sided, flat-topped mountains. Most of the treks are easygoing, following the valley floors through pastoral landscapes. But towards the end of each day I started to climb with the guide, following steep paths along narrow rising ledges, to the summits of these anvil-headed ambas. On the top, we emerged into a whole new world of luminous light and distant views. Here we found our home for the night, the community hedamo, perched in splendid isolation on the lip of a colossal escarpment, perhaps 3,000ft above the landscapes below. The views were breathtaking. We looked straight down, past circling eagles, to the world we had just left – ploughed fields, stone tukuls, eddying sheep, tiny white-robed figures trailing along dust lanes. Farther away, rivers carved swathes of ancient earth, canyons yawned open and valleys tumbled into one another. Farther still, mountains patrolled the horizons. With a slight turn of the head, I took in hundreds of miles. At Erar and Shimbrety , the stone-built guesthouses, with their little courtyards and roof terraces, were comfortable but basic. Village women prepared delicious Ethiopian dinners that made little concession to Western tastes. The loos, Western-style, were in spartan huts. Washing facilities were wooden buckets of warm water. There was no electricity, just lanterns and candles. Yet these felt like the most luxurious places I had ever stayed. It was the luxury of unique experience, of meeting local villagers on their own ground, of engaging with an ancient way of life, of being far from tourism’s well-trodden trails. And it was the luxury of spectacular location. I have never been anywhere with more stunning views. At Erar, night came with equatorial suddenness. A troop of gelada baboons , 30 or so strong, made their way home across the summit of the amba after a day’s feeding. They climbed down over the edge of the escarpment to precipitous ledges where they would be safe from leopards. The sun set over distant, mythical-looking mountains. When I turned round, a fat full moon was rising directly behind me. The world seemed to be in perfect balance. Tigray, too, has its remarkable buildings. Scattered across these mountains are more than 120 ancient churches, most excavated in remote rock-faces like caves. Until the 1960s they were virtually unknown to the outside world. Older than the churches at Lalibela, they are little understood by historians. Which means we are left with the fabulous oral history of the Ethiopians. Abuna Yemata Guh is one of the more challenging churches to reach. A rock butte soared above us; I was getting a crick in my neck and a serious case of vertigo just looking at it. I imagined, as with the sheer-sided ambas, that there would be some circuitous path, some scrambling route to the top. It was only when we had trekked up from the valley floor and gained the narrow ledge that I began to realise I was going to have to climb a cliff-face, in fact several cliff-faces, to get to church. A priest was waiting on the ledge, with the kind of morbid face usually reserved for the last rites. He advised me to remove my shoes and socks; bare feet would give me a better grip. It turned out that two men, who I had assumed to be casual passers-by, were in fact there to try to prevent me from plummeting to my death. We started to climb. My two assistants, one above and one below, guided me to precarious foot- and hand-holds. This was rock climbing without the ropes, the safety harness or the Chris Bonington confidence. Spread-eagled on the cliff-face, clinging to the minor indentations that passed for handholds, I felt a trifle out of my comfort zone. Had I know what was in for, I would probably not have chosen Abuna Yemata Guh for a casual visit. But once I reached it, I was thrilled I had. The climb might be hair-raising but the church is unmissable. At the top of the cliff, not daring to look down, I gazed ahead, just in time to see a side-chamber full of bones – the priest insisted they were deceased clerics, not fallen visitors. Then I shuffled along a narrow ledge and came to a cave-like opening. The priest wrestled with a key the size of a cricket bat. A door opened and I stepped into the gloom of the tiny church, hardly larger than a modest drawing room. As my eyes adjusted, I became aware of faces round the walls. Then the priest lit a torch and held it aloft. Suddenly the dark walls were alive with figures: apostles and saints, prophets and the archangels, Mary and the infant Christ. The famous Nine Saints from the Levant , who had brought Christianity to Ethiopia in the fifth century, were here, as was Saint Yared, who wrote so many of the early Ethiopian chants. The builder of this cliff church was here, Abu Yemata, mounted on a horse and accompanied by his nephew Benjamin, who had painted the murals. The priest, a humble villager, told me the stories that swarmed across these walls. He told the stories as they had been told to him, as they had been handed down from one priest to the next from the earliest days of the Christian era. He referred to the apostles as if they were old friends. He talked of the saints as if they were men who had known his grandparents. He told me about the groom who had neglected Yemata’s horse. Yemata had turned him into a weasel. There, he said, bringing his torch near to the wall, illuminating a small weasel-headed man beneath the horse. I asked why the church was here, so difficult to access, so high in these cliffs. The priest said it was for reasons of safety – it may well have been built when Christianity was still vulnerable. Then he added: “We are closer to God here, away from our world, and closer to His.” He lifted an ancient text enclosed in an ox-hide satchel from a nail on the wall. He asked if he should say prayers. I said I thought a few words might be a good idea. After all, I still had to get down that cliff-face. A recent documentary on the History Channel suggesting that the churches of Lalibela were built with the help of aliens! And supposedly the aliens are going to reclaim the Ark of the Covenant from Axum when they return to earth?!? The research and site survey being investigated by the BASE Institute has strong potential. Is it the path of the Ark of the Covenant? The BASE Institute does not make the claim that we have found the Ark of the Covenant. We’ll let you draw your own conclusions. In our opinion, it’s a candidate. The research continues. EDITOR’S NOTE: While investigating possible locations of the Ark of the Covenant, the BASE research team has conducted expeditions to Ethiopia, Egypt, Israel and Rome. Although the subject is controversial and clouded with confusion, one emerging theory indicates that the Ark of the Covenant was transported out of ancient Israel and may be in Ethiopia today. As unusual as this may sound, the BASE team has uncovered compelling evidence that the Ark may well have been spirited up the Nile River to an eventual resting place in the remote highlands of ancient Kush–modern-day Ethiopia. Although the Temple Mount in Jerusalem was the last known location of the Ark of the Covenant, its date of departure from the Temple is a topic of much debate. The last known reference alluding to the Ark’s presence in the Temple dates from 701 B.C., when the Assyrian king Sennacherib surrounded Hezekiah’s forces in Jerusalem. Isaiah 37:14-16 states, “And Hezekiah received the letter from the hand of the messengers, and read it; and Hezekiah went up to the house of the Lord, and spread it before the Lord. Then Hezekiah prayed to the Lord, saying: ‘O Lord of hosts, God of Israel, the One who dwells between the cherubim . . .'” This reference to the presence of God’s Shekinah Glory abiding above the mercy seat on the Ark of the Covenant, between the cherubim sculpted on the lid of the Ark, seems to confirm that the Ark was still located in the Holy of Holies in 701 B.C. It appears that the villain in the drama of the Ark was the subsequent king, Manasseh, and that the Ark most probably was taken out of the Temple during his reign. Although the extent of Manasseh’s evil does not allow a full description here, the Bible summarizes his deeds by noting that he did more evil than the nations the Lord had destroyed. He practiced wizardry and sorcery, placed pagan idols in the Holy of Holies, and shed innocent blood far and wide in the streets of Jerusalem. Our belief is that a pure Levitical priesthood, left over from the days of Hezekiah, would not have tolerated the degrading and polluting of the Temple containing the Ark of the Covenant. It is even possible that Manasseh would have ordered the Ark removed from the Temple before installing his own debased idols. Whatever the reason that the Ark was removed, it is interesting to note that just a short time after King Manasseh (687-642 B.C. ), King Josiah (who brought great reform to the Jews) mentions the Ark’s absence from the Temple. In 2 Chronicles 35:3 we read, “Then he said to the Levites who taught all Israel, who were holy to the Lord: ‘Put the holy ark in the house which Solomon the Son of David, king of Israel, built. It shall no longer be a burden on your shoulders. '” This not only appears to confirm that the Ark had been removed from the Temple, but also that the priests had been moving it somewhere in the manner prescribed by Levitical law. But if the Ark of the Covenant was removed from the Temple during the reign of Manasseh, to what location was it taken? We have discovered historical evidence that, during the reign of Manasseh in Israel, a colony of Jews – including Levitical priests – migrated from Israel and founded a colony on Elephantine Island in Egypt. It is strongly possible, if not probable, that the Elephantine Jews were escaping the desecration and persecution of the wicked King Manasseh, and that they had the Ark of the Covenant with them. In our visit to Elephantine Island, we thoroughly investigated ruins of a replica Jewish temple that had been built by 650 B.C., which precisely matched the dimensions of Solomon’s temple in Jerusalem. Of course, the practice of building temples outside of Jerusalem was strictly forbidden by Deuteronomic Law, so only the most dire of circumstances would have compelled a group of Jewish refugees to undertake such a project. Moreover, a temple replica would have been fruitless at that point in history without serving its primary function: as a resting place for the Ark of the Covenant. A number of ancient documents (such as the Elephantine Papyri) seem to confirm the existence of a Jewish Temple at Elephantine. Egypt, or at least certain districts of Egypt, would have been a safe haven for Jewish refugees, as we see from King Neco’s friendly appeal to Josiah in 2 Chronicles 35:20-21, less than a generation later. (It may even be that Josiah died trying to gain enough control over Egypt to reclaim the Ark). What’s more, our scholarly contact in Egypt, Dr. Atif Hanna, curator of the Aswan Museum, has concluded, from his own investigation, that the Ark of the Covenant did indeed come to Elephantine Island during the reign of Manasseh in Israel, and that it was housed in the replica temple. However, Dr. Hanna has also determined that the replica temple was destroyed for unknown reasons – possibly the advance of a new, aggressive from of idol worship – in 410 B.C. That event, then, raises the question: Where would the Ark have been taken? Where might our search lead us next? At this point, all indicators pointed toward Ethiopia. If such a marriage took place, it is easy to see that a line of Mosaic descendants in Ethiopia would provide an ideal place of refuge for the Ark. This would be especially true if its welcome had been revoked further down-river in Egypt, and if its return to Israel was not possible because of the Babylonian conquest of Jerusalem in 587-586 B.C. Our research on-site in Ethiopia led us to the shores of Lake Tana, a body of water 53 miles long and 41 miles wide, located on the headwaters of the Blue Nile. Isolated far out on the waters of Lake Tana is Tana Kirkos Island, considered by the Ethiopians to be a holy island, populated only by Ethiopian, Christian monks. The monks of Tana Kirkos believe they are living on the island where the Ark of the covenant rested, and where Levitical-style blood sacrifices were performed until 338 A.D., when the nation of Ethiopia converted to Christianity. The monks of Tana Kirkos escorted us to a high plateau where they showed us several large, moss-covered stones which they said had previously been used in sacrificial ceremonies when the Ark of the Covenant was on the island. They also told us that the rock surface on which we stood had been the location of a tabernacle-like tent that had housed and protected the Ark. Intrigued that a tent had been on the rock surface, I excavated some loose topsoil and discovered four hand-carved socket holes, spaced to create a 13′ by 13′ square, oriented in a north-south/east-west configuration, apparently to emulate the original Holy of Holies. The monks then asked me if I would care to see implements from Solomon’s Temple. Intrigued by their statement, I waited expectantly while a monk approached a large mud-brick building, unlocked a heavy latch and lock (the only signs of modern society present on the island), entered and then emerged with four large, heavy artifacts. I first was shown two large metal forks, which they claimed were meat forks used for burnt offerings in Solomon’s Temple. They were about 4-1/2 feet long and bore the ancient symbol of a budding almond flower on the top of each one. Next the monks showed me a large, bronze bowl that was approximately 22″ across and 2″ deep. They referred to the bowl as a “gomer,” and described it as a vessel in which priests placed animal blood during temple ritual, stirring the blood occasionally to keep it from coagulating. Finally, the monks showed me a metal stand, approximately 3′ high, designed to hold the bronze bowl, though extreme age had caused the metal of the stand to fatigue and droop. I asked the monks why these items remained on the island, and they told me that, in 338 A.D., King Ezana was converted to Christianity by a Syrian monk named Abba Salama. Since Christianity was then decreed the new religion of the country, blood sacrificial ceremonies were no longer used, and the implements were rendered obsolete. My next question was key: If the implements of sacrifice were left with the monks, what happened to the Ark of the Covenant? I was told the Ark itself was taken to Axum, where today it is kept in absolute isolation at St. Mary’s of Zion Church. We next journeyed to Axum, the purported resting place of the Ark of the Covenant, and made our way to St. Mary’s of Zion Church. There I was introduced to a man referred to as “The Guardian of the Ark of the Covenant.” This man, reportedly, lives his entire life inside a fenced-off area surrounding St. Mary’s of Zion. He will not leave this fenced-off compound until he dies–when he will be replaced by the next Guardian of the Ark. In the chapel of the church, 30 robes from 30 previous guardians are on display – and every one of those 30 professed that the object they protected was the true Ark of the Covenant. I was able to speak, through an interpreter, with the Guardian of the Ark, who told me that no other man besides himself could lay eyes on the Ark, that it was an absolutely holy object. He said that the world would not be allowed to pollute it by looking at it. He added that he and the villagers would protect the Ark with their lives, if necessary. Interestingly, we were shown two silver trumpets that bore a remarkable similarity to the trumpets pictured on the arch of Titus in Rome, commemorating the Roman conquest of Jerusalem and the destruction of the Temple in 70 A.D. Trumpets like these were an essential part of the implements used in Temple worship. Subsequent to this initial investigation, we located and interviewed two people who have claimed to have seen the object resting in St. Mary’s of Zion. The first was a 105-year-old priest who once was the Administrator at St. Mary’s of Zion. On two occasions, he said, when the Guardian of the Ark died and a new guardian was trained in the worship rituals, he was able to gaze upon the relic. He described it as a gold box with two winged angels on top. In his detailed inventory of the treasury, he described the Ark as a gold box with two winged creatures on the top. He described 24 smaller angelic-type figures forming a molding around the top, with two green stones (not described in the Bible) at either end. Is this the Ark of the Covenant described in the Bible? At this juncture, we cannot say with certainty that it is, but neither can be say for certain that it isn’t. What we have concluded is that St. Mary’s of Zion church in Axum, Ethiopia, is the resting place either of an incredible replica of the biblical Ark of the Covenant, or, of the actual Ark of the Covenant itself. Is the Bible entirely silent on the subject of the Ark of the Covenant’s current resting place, or of its existence between the present day and the eternal kingdom? Some argue that Scripture is, indeed, silent, and that the Ark is a moot point now that the Messiah has come, suffered and died for the whole world. Others, however, suggest that there may yet be a role for the Ark to play during a period of time following a real and triumphant victory by Messiah over the armed forces of the world system, before He institutes His eternal kingdom on a new earth. Called ‘Dalle des Chevaliers’ in French, this engraved stone is said to have been the cover stone of the crypt beneath the church at Rennes-le-Château. According to the legend, Saunière found it lying upside down and had it lifted by Adrien Marre and Féliciean Marceau, two local workmen. Beneath the stone was a hole in which Saunière allegedly found a small pot containing a couple of goldpieces, a Visigoth necklace and a golden Chalice dating from around the 13th century (that he later gave to his friend Abbé Grassaud). He told the workman that he had only found some worthless Medallions of Lourdes and sent them home. He apparently didn’t recognize or appreciate the value of the cover stone itself for he used it as a stepping stone for the Calvaire where it was ‘re-discovered’ in 1926. According to Henry Buthion, who ran the Saunière estate for some 40 years after he had bought it from Noel Corbu in 1965, the stone once sealed the mural tomb of Sigebert IV. Buthion was convinced that Saunière discovered this tomb and took jewellery and two golden crowns from it that he gave to friends and relations. The stone is thought by some to depict the flight of Sigebert IV to Rennes-le-Château in 1681. 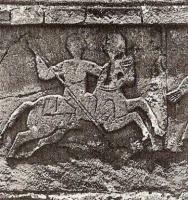 Others have noticed the resemblances with the official seal of the Knight’s Templar of two men riding one horse. Dutch writer Klaas van Urk recently made a case for the stone to depict the two entrances of the Grail Church Bieta Mariam in Ethiopia, once the place where the Ark of the Covenant was hidden. In his explanation, the left part of the stone depicts the ritual of preparing the Ark of the Covenant, the right image is a Grail Knight carrying the round symbol of the Holy Light. Fact is that the image engraved over the double entrance of Bieta Mariam bares a striking resemblance to the right tableau of the Dalle des Chevaliers.